New branding and corporate identity for a Houston based manufacturer of drive through windows. Our branding experts performed extensive marketing research and boiled it down to a strong value proposition that just happened to make a great tagline. 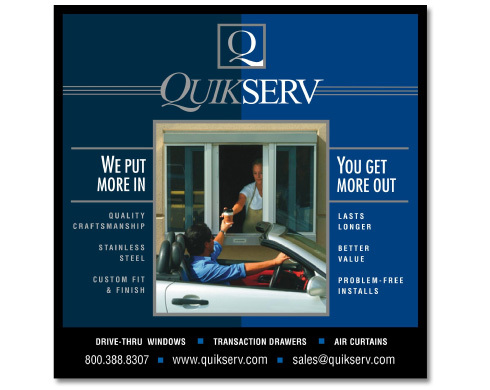 Thus, "We put more in - You get more out" now communicates QuikServ's differentiating message across all media - from their trade show display, website and print ads in trade magazines to their printed sales and marketing collateral which we redesigned. 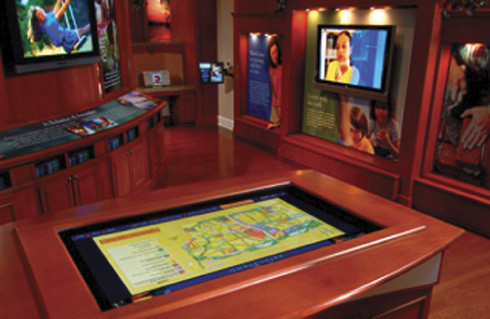 Multi-media content for the Welcome Center of this large master-planned community in northwest Houston. We produced video content for the mounted display screens, interactive content for the small mounted touch screens, and interactive plat maps for the large, table-mounted touch screen. 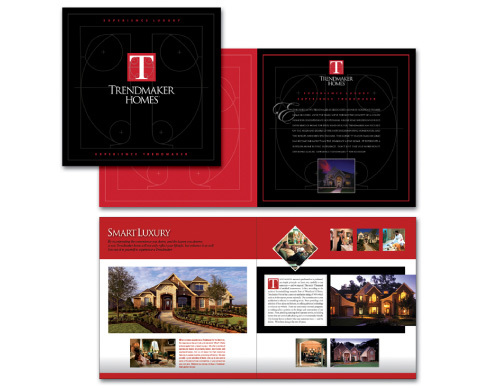 Marketing brochure promoting Houston's leading luxury home builder. 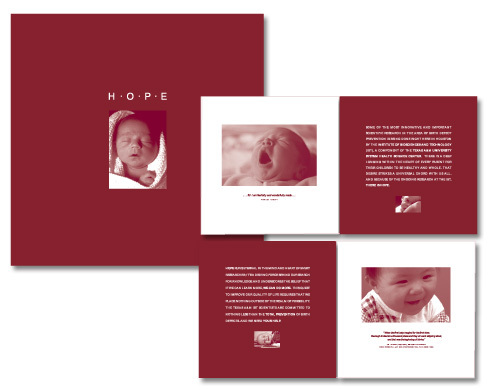 The deluxe four-color brochure includes a large format custom pocket folder to contain informational inserts. The brochure is distributed at all model home sales centers and through their new website, which we recently redesigned. 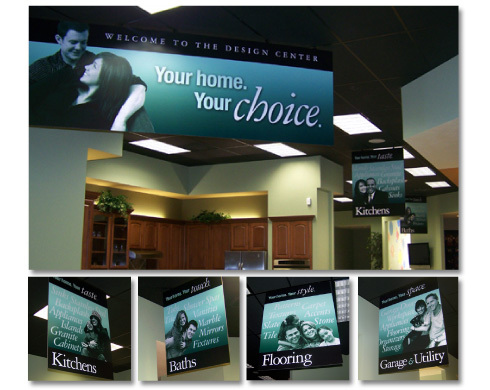 Signage program and display graphics for the new MHI Design Center. One of the largest home builders in Texas, MHI brands include Pioneer, Plantation, Coventry, and Carmel Homes. Marketing and advertising campaign for a construction company based in Houston that specializes in the construction of new mega-church facilities nationwide. 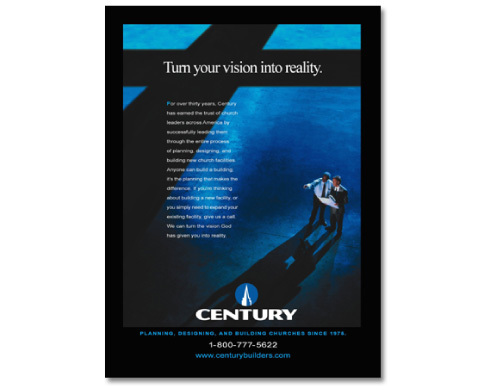 The campaign included a series of print ads, e-mail, and direct mail, along with updating their graphics and re-designing their website and trade show booth. Invitation and promotional materials for the Texas A&M Health Science Center Institute of Bioscience and Technology (IBT). The IBT specializes in research for the prevention of birth defects. We developed the theme and designed the invitation and all the promotional materials for the inaugural fund-raising event. Hoping to break-even with this first effort and lay the foundation for future fund-raising events, the "Hope" luncheon exceeded all expectations and raised significant funding for the IBT. 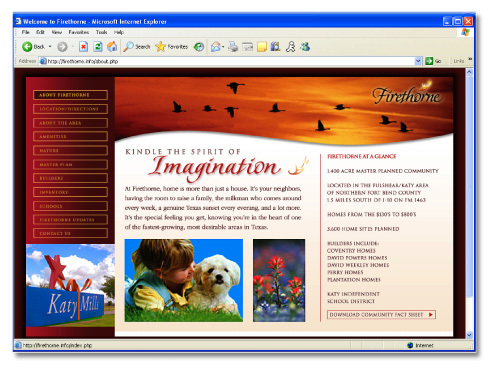 Promotional website for Firethorne, a master-planned community west of Houston developed by Jefferson Development Company. COPYRIGHT 1996 - 2019 VISUAL MARKETING IN HOUSTON TEXAS ALL RIGHTS RESERVED.